Dr. “Tony” grew up on Vancouver Island, graduated from the University of Victoria (B.Sc. 1985) and the University of British Columbia (D.M.D 1989) and has practiced dentistry in sunny downtown Lantzville for his entire career. He built the Lantzville Dental Building in 1993. He is married to Susan, who has assisted him at the clinic since 1990! They have 2 active children. Tony has been an active participant in various hands-on study groups in dentistry including: RV Tucker Cast Gold Study Club, Vancouver Dental Education Centre, Occlusion Connections (Las Vegas), California Centre for Advanced Dental Studies and Esthetics, and Spear Study Club. While offering services for all aspects of family dentistry, as a result of his extensive participation in various study clubs, his focus involves smile design and esthetics, reconstructive dentistry, and treating chronic pain and temporomandibular related disorders. Tony has many interests. He especially enjoys family recreational activities and travel and any opportunity in making memories with family and friends. He also loves the Boston Bruins, Ferrari, and the Italian soccer team, but not necessarily in that order. He’s received two community service awards in recognition of his extensive community service record. Sean was born and raised in Edmonton, Alberta. He attended the University of Alberta where he graduated with a Bachelor of Science and Doctor of Dental Surgery degree. He also received an award for Periodontal Excellence. Sean has been working in his field for over 23 years. He’s very passionate about his work and is always improving his dental skills. He participates in a Spear Study Club and belongs to the Island Pursuit of Dental Excellence Group. He also completed The Kois Center dental curriculum of over 200 hours of advanced dental education. Sean is known to provide gentle and quality dental care. Seeing the improvement in a patient’s function, comfort and aesthetics is very rewarding. On a personal level, Sean tries to spend as much time with his family as possible. He loves traveling, snowboarding and trail running. He’s most proud of his 3 children and who they’re growing up to be. Charities are also a big part of Sean’s life and he contributes monthly to various organizations including the BC Children’s Hospital, Nanaimo Child Development Centre, Plan Canada, Red Cross, BC Cancer Society and the Nanaimo & District Hospital Foundation. He’s also a founding board member of Aspengrove School. He can play piano and he’s very good at movie trivia. Aileen graduated from the University of Alberta with a Bachelor of Science and Doctor of Dental Surgery (with distinction) degrees in 1994. She’s now lived here on Vancouver Island for over 21 years. Aileen was born in the Philippines and moved to Edmonton in 1986 with her family. Aileen is known for her gentle delivery of dentistry and making her patients feel comfortable. She thoroughly explains procedures and educates them to keep them at ease. She enjoys building long-term relationships with her patients and helping them restore their occlusion and function. Aileen is always continuing her education in dental health. She’s a current member of Island Pursuit of Dental Excellence (IPODE), a study club for dental practitioners and specialists and has been for the past 7 years. She also attended the The Kois Center in Seattle – a world leader in advanced dental education. She completed the curriculum of 9 courses and over 200 hours of didactic and clinical training for graduate dentists. She enjoys keeping a nice balance between work and personal life where she’s a proud mom of 3 children, ages 13, 11 and 9. She likes skiing, gardening, camping and the outdoors. She also volunteers with her children’s school, swim club and Kirkwood dance academy. She wishes she could do half of what they do. Aileen supports many charities, including the Nanaimo & District Hospital Foundation, BC Children’s Hospital, Nanaimo Child Development Centre and the Red Cross. If she could do anything even if she didn’t get paid to do it, she’d be a chef! She would also be a great event planner since she pays attention to detail and is a good multi-tasker. Rae is a native Albertan and enjoyed attending university in Calgary, California, Seattle and Edmonton. She received a BSc degree at the University of Calgary and her DDS degree at University of Alberta both with distinction, and graduated first in class with gold medals in general and paediatric dentistry. When she chose her career, Rae had no idea how much she would love it and the people she would meet. She also didn't know that one of her favourite parts of the job would be endodontics! Thirty-five years of practice have flown by and she continues to yearn to learn more, through memberships in local study groups and courses and conference both local and not-so-local. She is thrilled to be heading to the FDI World Dental Congress in Madrid. When not at work, Rae enjoys trying to rescue her garden, reading, pondering mysteries of history and politics, and catching magic moments with her children. She pretends and intends to also run and cycle. She’s traveled twice with KIA to deliver dental care in Cotacachi, Ecuador and in Chisec, Guatemala. Dr. Ivan Zolotco grew up in Chisinau, Moldova and moved to Canada in 2009. He obtained his Doctor of Dental Surgery degree from The University of Western Ontario, Schulich School of Dentistry as well as a DMD degree from The State University of Medicine and Pharmacy, Faculty of Dentistry in Moldova. 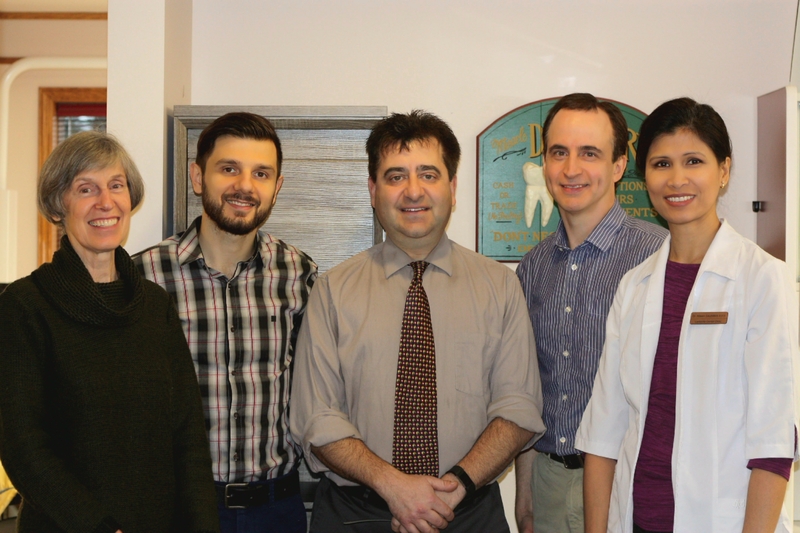 He is an active member of the Canadian Dental Association, British Columbia Dental Association, Victoria and District Dental Society and the Academy of General Dentistry. Ivan has many passions, including giving his patients and their families happy and healthy smiles. He strives for excellence and helping to make his patients as comfortable as possible, delivering the best results. Improving his patients’ oral health and their general health is a top priority for him, along with continuing his education and self-improvement. On a personal level, Ivan is passionate about helping people and being active in his community, as well as reaching out to other communities. He cares about protecting the environment and maintaining a healthy lifestyle. He enjoys spending time with his wife, doing yoga, hiking, soccer, playing bass and acoustic guitar and, traveling. Along with Ivan's passion for community, he’s done a lot of volunteer work. He’s worked with the Dental Outreach Community Service at University of Western Ontario, providing free dental care for underserviced population. He’s also volunteered with the Toronto Vegetarian Association, Paramedics Assistant in Chisinau, Moldova as well as sponsoring children in Kenya.